Jocelyn’s Birthday – Thank You! Hmmm…. Wow…. I don’t know where to begin! We are truly blessed! God is good! We have been blessed with not only this amazing little girl but such wonderful family and friends. We pray that each of you will be blessed as we have. The feelings of appreciation towards all of you are to much to even explain. We are so grateful for everyone. You have all touched our lives in so many ways! Thank you to all that were able to join us to celebrate Jocelyn’s Birthday! It was great to see everyone. Thank you for the generous gifts and the time you were able to spend with us. We had a wonderful time. We will be sure to post pictures of Jocelyn swinging in new swing on the playground that you have helped us to get. Thank you! For those who don’t know we took Jocelyn to the circus on Sunday. It was such a great experience. She is such a trooper and did a wonderful job. It was the Cole Brothers circus. And they treated us like royalty. We had lots of fun. You will have to check out some of the pictures. Jocelyn got to ride on an elephant and a pony. We had such a great weekend! Thank you to all those that made it possible. We love you! Happy Easter to everyone! We hope you are enjoying this wonderful weekend as much as we are. We are sad to have not been able to spend the time with our family but are thankful for the beautiful weather and the time we have been able to spend with each other. We are slowly coming out of hiding. We were able to enjoy both Friday and Saturday working in the yard. Jocelyn enjoyed helping and watching from her wagon. She did such a great job being outside most of the day. She loves it out there. Also we began this glorious day with the sunrise service at our church. We were very excited to be able to go back. It has been a while. We made the decision not to go to church during the cold and flu season. It was a sad decision for us but as we have said to many of our friends and family this season “better to be safe then sorry” It was great to go back! After church we brought Jocelyn home to hunt for Easter eggs. She was sooo cute. Just giggling away. We have several little short video clips on here trying to capture her excitement. She just loves it. I think she could have searched for eggs all day. As for the the basket. I believe her favorite thing was the slime. Yes, cold, wet, ewy, gooey, yup our baby loves it. And water I think she would play in water for hours at a time. We will be updating more often now that the weather is getting warmer. We hope to have a fun filled spring/summer with lots of new experiences for our baby girl. Next on the list is the birthday! It is amazing how fast the time goes. 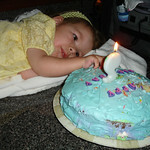 It is hard to believe Jocelyn will be two years old!